It's a moniker that perfectly fits the Swedish quartet, as their music is all about being on the move: shifting to the next level, covering new ground and travelling through terrains of as-yet-unknown extremes. This group abides by no boundaries and their musical vision is as vast as their abilities. Although it was not until the year 2000 that PASSENGER's vision begun to materialize, the group traces its history all the way back to 1995. Patrik Sten (Transport League) and Niclas Engelin (Gardenian) had both grown weary of solely shredding thrash and death metal in different constellations and felt the urge to do something that was more song-oriented and dynamic. With a desire to compose hard-edged material with more noticeable pop/rock influences they formed the band Cliff to satisfy these urges. Inspired by groups like Handsome, Chum, Helmet and Depeche Mode they recorded two demos that never made it further than their own CD players. Still, their mission was born: edgy and groovy songs with a twist and clean vocals. Considering that Sten and Engelin were both busy with their full-time bands, Cliff were forced to take a break for a couple of years. In 1997, Engelin was hired as a session guitarist for In Flames on their Whoracle tour, but this would further the development of PASSENGER. During this tour, In Flames vocalist Anders FridÃ©n and Engelin indulged themselves by sharing the same visions and goals. "We just tortured the other guys with bands like Chum, Handsome or The Tea Party, among others," recalls Engelin. "From early on it was clear that we should form a band together and play good and catchy songs." Since this brand of music was exactly what Engelin and Sten were doing in Cliff, there was no need to search for other members. The group was soon rounded out with bassist HÃ¥kan Skoger and one name change later, PASSENGER had arrived. The group's first demo, which was only a hint of how PASSENGER would sound, was recorded in summer of 2000. 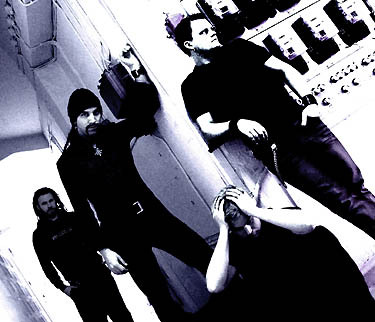 By the time they recorded their second demo in 2001, as early versions of "Used", "In My Head", "Circus" and "Drowning City" found their way onto tape, they had started to derive their own unique style. The reactions to these songs were amazing, which was reason enough to keep up the work and record a third demo in FridÃ©n's Phlat Planet Studio (which is located in the same building as the legendary Studio Fredman) in mid-2001. Since Sten was working as an engineer in Studio Fredman, it was only natural that they compiled and mixed their debut album, simply entitled Passenger, in the same location. The group prides themselves on taking many years to find their own identity and sound, making this a record into which they invested much emotion and energy. When asked about the concept behind unusual titles like "In Reverse," "Carnival Diaries" or "Circus," FridÃ©n offers a riddle saying, "You can describe them as a playful introversion with a sense of realistic irony." FridÃ©n also displays a cleaner, more melodic vocal approach in PASSENGER than he does with IN FLAMES, further showcasing his truly dynamic abilities. An aggressive mixture of melody and melancholy, PASSENGER offer something for all fans of heavy music on their maiden voyage. You better strap yourself in because this is going to be one wild ride.